Corrective nail surgery is a common procedure with a 95% success rate. A nail may need to be partially or totally removed for many reasons for example: Ingrowing toe nail; Damaged/ thickened nail; Chronic fungal nail. Nail surgery is carried out under local anaesthetic so you will be awake. Once the toe is completely numbed the offending piece of nail is removed and a chemical called phenol is applied to prevent regrowth. The toe is dressed and written advice and a dressing pack is provided as well as the date of your next appointment. The anaesthetic will wear off after around an hour and a half. Please allow an hour for the procedure. We advise you to wear or bring open toed shoes or sandals with you to wear post operatively and ideally for the first week. Driving when your toe is anaesthetised may invalidate your insurance and make you unfit to drive, therefore please arrange transport home. Rest with your foot elevated for 24hrs save pottering to the toilet and do not get the toe wet for 24hrs. If you feel any discomfort we advise you to take a mild painkiller which you would normally take for a headache (but not aspirin). Occasionally, due to feet being on the ground, infection can occur if this happens call Stride Clinic or your GP and explain the circumstances. Healing usually occurs around six weeks. LCN Toe Nail Reconstruction (aka Wilde-Pedique) is a highly effective toenail correction system, comprising an extremely elastic UV gel, which adapts to the movements of the toe and the forces exerted on it. It is an ideal solution for men and women who are looking for a cosmetically pleasing look and its unique adhesive properties mean that good results can even be achieved even on callus layers of skin- very suitable where a toenail is missing or damaged or in the case where a nail has surgically been removed and there is an unsightly regrowth. Wilde-Pedique is odourless and will not discolour. It causes no damage to the natural nails, and no moisture can penetrate so if it’s used to cover fungus, it will prevent the fungus spreading further. It can be treated as a normal nail- filed, cut, and polished. Polish can be removed in the normal way without any damage to the nail. It’s easy to maintain, just treat it as you would your other nails! Wilde-Pedique is effective on scaly nail surfaces, for correcting ridges and deformations, for hiding discolouration (in the case of fungal nails) and for protecting growing toe nails. It does need refilling every 4/6 weeks until the nail is grown fully. Who would benefit from Toe Nail Reconstruction? This treatment can be used in conjunction with fungal nail treatment either in the form of topical or oral antifungal treatment. Although Wilde-Pedique is not a cure it should help in limiting the spread of the fungal infection and it will certainly go a long way in boosting your confidence in being able to show off your feet. A prosthetic nail may help the new nail grow into place along the nail bed thereby minimising risk of an ingrown nail or in cases of surgery constructing a completely new nail on the nail bed. 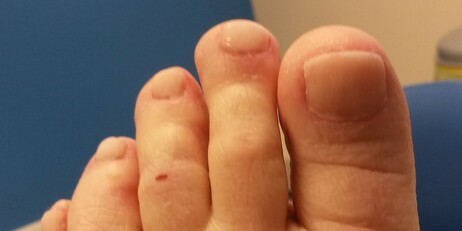 The treatment will not work when the nail bed has been removed as it needs a portion of nail to adhere to.